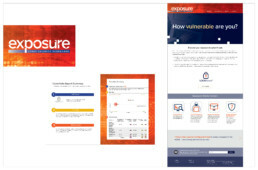 Exposure is an idea for a cyber security business that we developed internally. We started by partnering with a client to build out the senior leadership team. Then: we developed the business model and found experts in the field who could help us refine it; named the company and created all of the corporate identity; designed and built out its online presence, including website and all relevant social media channels; designed and developed all marketing and sales materials; created strategic partnerships with industry insiders who could provide us with credible access to potential clients; found, pitched and closed investors.